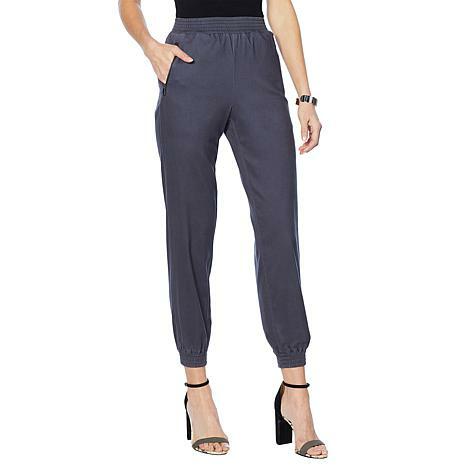 Exude elegance with a street-chic vibe in stretch sateen joggers that wear beautifully day or night. Go from couch to nightclub in statement-making fashion from Motto. However, unless you have very slim ankles the elastic could cause a problem of being very tight. The fabrication is perfect. Im 59, the length is perfect. The manufacturer needs to consider another type of elastic for the ankles. So sad back they go. I ordered satin but pants were faux suede??? Called customer service was told right item # but not satin. I havent seen any reviews yet! Anyone else receive satin? ?